Hybus, the hybrid bus project developed by Pininfarina, with the contribution by the Piedmont Region, has been awarded with the Premio all’Innovazione Amica dell’Ambiente, a national prize from Legambiente, focused on company innovation in the environmental field. The 2011 edition of the award, received by the Chairman Paolo Pininfarina, featured among its themes the mobility, a subject particularly valuable for Pininfarina, which has been a pioneer for many years in the research for effective and economic solutions aimed at achieving more and more rigorous environmental and emission goals: the installation of hybrid or full electric powertrains on individual or collective transport vehicles, the adoption of lighter and more recyclable alternative materials, the active and passive safety, the computerized traffic management. 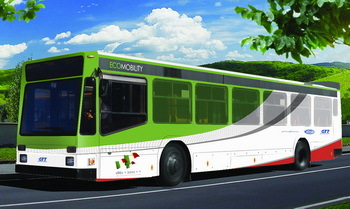 The Hybus project has been favorably welcomed by the Jury for various reasons: “the contribution to the reduction of pollution, consumptions and noise; the reduction of waste and of natural resources consumption thanks to the concept of revamping obsolete buses; the economic advantage for TPL Companies and Public Administrations, together with a low purchase cost (-60% if compared with a new hybrid bus) and a lower operating cost (vs. a full Diesel); the use of Italian technology (Pininfarina, Fiat, Magneti Marelli, Faam); the potential employment impact; the international competitiveness (the product/service could be offered also abroad, in particular in the Countries with a major attention to the environment)”. With Hybus, Pininfarina is in fact proposing the conversion of buses powered by obsolete Euro 0-1-2 engines into serial hybrid. The first demonstration prototype, realized to validate the technology and to verify its industrial feasibility, has been developed in collaboration with GTT (Transportation Company of Turin City), since the solution was originally designed for the City of Turin. The project is, by its nature, exportable to any town sensitive to environmental protection. In particular, the original engine is replaced with a 1.3 liters Multi-jet Diesel power unit, meeting Euro 5 rules, with 69kW max. output, directly coupled to the electric generator, which provides energy to the main battery pack. Special electro-powered units give hydraulic and pneumatic services. The traction force to the original rear axle and drive-line is delivered by two Magneti Marelli electric motors mated to a collector-reduction gearbox. The lithium-ion battery pack and the Battery Management System are supplied by FAAM and the new power plant is integrated with the basic original electrical/electronic design. Thanks to the energy management software developed in collaboration with partners, Hybus recovers energy during braking. The development of the Hybus project was possible thanks to the contribution of the Piedmont Region, who partially covered the costs in the testing phase. Pininfarina is in fact one of the eight Companies benefiting by the first tranche of financial resources that the Piedmont Region provides to the Piedmontese Companies which intends to qualify and reinforce, as foreseen by the provision 2.3 “More development” within the Extraordinary Plan for Employment. “We are very satisfied with this important recognition obtained by Pininfarina, - comments the Assessor to the Economic Development, Massimo Giordano -, which has been possible also thanks to the contribution of the Piedmont Region through an innovative provision within our Extraordinary Plan for Employment. It is a concrete and effective result, which goes into the right direction as to use of public resources aimed at stimulating excellent and competitive projects, with positive effects from the employment and environmental sustainability point of view. These are the many important goals that we succeeded in achieving with one measure. We will continue our engagement in the development of an effective collaboration with Companies, in order to obtain brilliant results as the one we applaud today”. “The Hybus project is part of the sustainable mobility activities, one of the priority strategic lines for Pininfarina – adds the CEO of Pininfarina, Silvio Pietro Angori. – For its technological complexity, Hybus summarizes all our skills in the sustainable mobility field. The hybrid driveline can be used not only to revamp obsolete buses that should otherwise be wasted, but on newly manufactured buses and commercial vehicles as well. We are happy and proud that ‘Legambiente’ recognized the importance of this project. Its development has been possible also thanks to the financial contribution by the Piedmont Region, for which we are grateful to the President of the Region, on. Cota, and to assessor Giordano. A special thanks goes also to the GTT management, who has been supporting the initiative since a long time and who, we do hope, will be in position to benefit by the advantages offered by our technology”. Hybus was developed in the Pininfarina's Design and Engineering Centre of Cambiano (Turin), which has already developed the Pininfarina BlueCar in collaboration with the French Group Bolloré, and the Nido laboratory, which has so far generated two projects: Nido EV, running electric prototype of a city car, which was also exhibited in Piazza Duomo at MobilityTech, and a Vehicle Demonstrator mechanized and electrified by Pininfarina for Auto Shanghai 2011, an ultra-efficient modular structure based on an aluminum space frame and use of composite materials, such as carbon fiber and aramid fiber honeycomb.